I am not sure what new I can say about Edward Burtynsky's photography. The theme of the scale of the human influence on the landscape that is the built environment is thought provoking for each person in a different way. In spending time with this work in the Arthouse Films documentary by Jennifer Baichwal it draws a reflection. Perhaps the photographer's own commentary on the stills taken from over two decades of work revealed for me the dual aspects of exploration and intention. The shadow of the human psyche is the parts we deny. In seeking out the natural grandeur and beauty of the non-man made landscape we find solace in that part of nature not yet denied to us. What then is the manufactured landscape if not other than a reflection of nature - being the spore of ourselves reflecting our human nature? Burtynsky has sought this hidden part out, lest we deny it, and deny that part of ourselves. 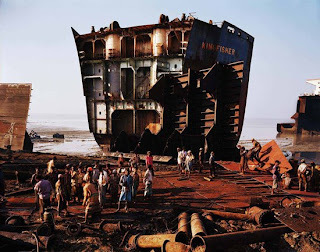 In the portrayal of the ship breaking yards of Bangladesh recurrent images of the efficient creation and destruction of the detritus of the rainforest kept occurring for me. Within thoughts of the social justice aspects, it is the removal of value from the decaying by the leaf cutter ants that sustains the unsustainable in a cycle of distribution and renewal. 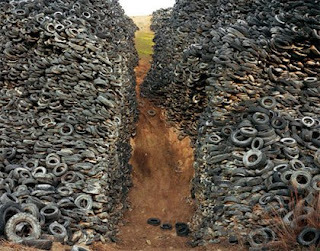 In the unnatural landscapes of Burtynsky's record are natural phenomena. Be they the formation of chemical rivers, of mountains that appear through the gradual addition of individual particles, in computer chips or tyres, or the faceted erosion of canyon walls made of slate, marble or iron ore - the human intervention creates natural landscapes no different to those we are inspired by in the environment without man. The difference lies in their toxicity to the life of man and to all other life. The question asked by his art is not a simple 'right or wrong, but requires a whole new way of thinking', for in this examination of the non-natural is revealed, not the unnatural, but the 'human' natural in a whole new ecology of productive inequity at scales we are only just beginning to understand.